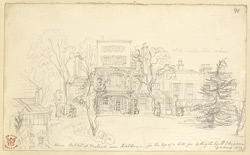 The footnote to this drawing reads " House sketched at Westend, near Kilburn...". This refers to the area around West End Lane, located between West Hampstead and Kilburn. Records from the 13th century state that the area was known as "Le Rudyng", suggesting a woodland clearing. The title "West End" was in use by 1534 and referred to the freehold estate that belonged to Kilburn Priory. By 1800 the site comprised of cottages and parkland, and was so quiet that residents claimed they could hear the guns at Waterloo. All this was to change by 1860, however, when a foundry and railway emerged nearby. Major building work around West End Lane occurred in the late 19th century, most of which suffered heavy bombing in WWII.